Draco is an extended constellation of the northern hemisphere. 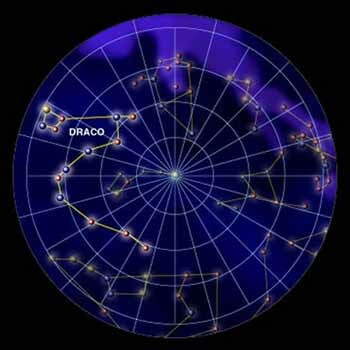 Draco (Latin for Dragon) is a far northern constellation that is circumpolar for many northern hemisphere observers. It is one of the 88 modern constellations, and one of the 48 constellations listed by Ptolemy. 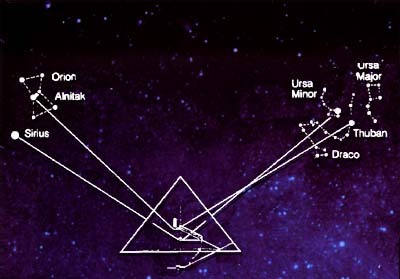 The star Thuban (Draconis) was the northern pole star around 2700 BC, during the time of the ancient Egyptians. Due to the effects of precession, it will once again be the pole star around the year 21 000 AD. In ancient Egypt, the stars of modern-day Orion represented Osiris, god of the dead. Khufu's burial chamber was allegedly fashioned deep inside the Great Pyramid. Two skinny shafts bore outward from the chamber. For decades, scholars thought they were airshafts. But in the 1960s, astronomers found that they have an astronomical purpose. At the time the pyramid was built, one of the shafts aimed toward the star that was then closest to the north celestial pole. The other aimed at the Belt of Orion, one of the brightest and most impressive constellations. The north celestial pole is the "hub" of the northern sky. All the stars appear to rotate around this hub. Today, the star Polaris marks the north pole. But Earth wobbles on its axis. It takes about 26,000 years to make one full wobble, and in that time, the north pole points to different stars. 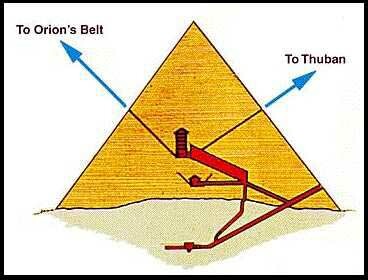 When the pyramids were built, the star closest to the pole was Thuban, in Draco, the dragon. The stars close to the pole never set. The Egyptians described these stars as "imperishable" or "undying." Khufu expected that when he died, he would join not only with the Sun, but with Thuban as well - maintaining order in the celestial realm, just as he had on Earth. Pharaoh also expected to join with Osiris, the god of the dead, who was represented by the stars that we know today as Orion. Although Thuban's Bayer designation is Draconis, it is not the brightest star in the constellation. At magnitude 3.65, it is more than a magnitude fainter than the brightest star, Draconis (Eltanin), whose magnitude is 2.23. There are several double stars of interest in Draco. Draconis (Kuma) consists of two components of magnitude 4.9, 62 arcseconds apart. They can be split with binoculars. R Draconis and T Draconis are Mira-type variable stars. R ranges between magnitudes 6.7 and 13 with a period of 245.5 days, and T ranges between magnitudes 7.2 and 13.5 with a period of 421.2 days. Draconis is relatively close to Earth, only 18.8 light years away. The four stars forming the dragons head (beta Dra, gamma Dra, xi Dra and nu Dra), build a conspicuous asterism called the Lozenge. Draco belongs to the few constellations which really resemble the object they were named after. The northern boundary reaches higher than DECL=+80 degrees, the southern border stretches along DECL=+50 degrees; to the east and the west it extends from RA=10h to RA=20h. It looks like Draco is encircling the Little Bear, Ursa Minor. Epsilon Dra is a good double to be observed with scopes at a moderate magnification. Its companions are about 3 arc sec apart. The binary mu Dra is a good test for a scope with an aperture of 60mm. Good optics might split that pair consisting of two F7 main sequence stars (5.83 mag and 5.80 mag). An outstanding binary is nu Dra. The two white stars (an A6V and an A4m) have magnitudes of 4.88 and 4.87. They are a good object for binoculars. Small scopes reveal the 8th mag blue companion of the G9IIIbCN-0.5 star omicron Dra (4.66 mag). A good binocular may be sufficient to split the pair of psi Dra. Small scopes show a 5th mag star and a 6th mag star. Another easy pair for small telescopes is 40-41 Dra. The two yellow stars are of 6th mag. Its coordinates are roughly RA=18h and DECL=+80 degrees. A really impressive triple system is 39 Dra. Field glasses show a wide double; in larger scopes a third star close to the brighter one occurs. Another attractive triple is 16-17. In binoculars two blue-white stars of 5th mag are revealed. Viewing with a telescope shows another star of 7th mag close to one of the first two. At a magnitude of 8.8, the planetary nebula NGC 6543 is one of the brightest in the sky. It was the first planetary nebula to be observed with a spectroscope; the observers were surprised to find emission lines in the spectrum of this object. In the middle of January the shower January Draconids seems to be active. There are only few hints for the existence of this shower. The Eta Draconids take place from March 22nd to April 8th. The maximum occurs between March 29th and March 31st. Between March 13th and April 17th the meteor shower of the Tau Draconids can be observed. The maximum occurs around the end of March. There is only little evidence for the showers of the September Eta Draconids and the Omicron Draconids. There are a number of myths behind the constellation Draco, due to its resemblance to a dragon, although alternative interpretations exist, such as the legend of the Mother Camels, the name given by ancient Arabic nomadic tribes to an asterism in the constellation of Draco. Instead of the head of a dragon, the asterism is interpreted as a ring of mother camels surrounding a baby camel (the faint star in the middle), with another mother camel running to join them. The camels were seen to be protecting the baby from a line of charging hyenas. In the most famous of the myths, Draco represents Ladon, the hundred-eyed dragon that guarded the golden apples of the Hesperides. The eleventh of The Twelve Labours of Heracles was to steal the golden apples. Heracles killed Ladon with a poisoned arrow, allowing him to freely take the golden apples. According to the legend, Hera later placed the dragon in the sky as the constellation Draco. Due to its position and nearby constellations in the zodiac sign of Libra (i.e. Ursa Major, Ursa Minor, and Bootes), the group of constellations can be seen to tell the tale of the eleventh labour. In another legend, Draco represents the dragon killed by Cadmus before founding the city of Thebes, Greece. In a third legend, it represents the dragon that guarded the Golden Fleece and was killed by Jason. The fact that the stars of this circumpolar constellation never set plays an important part in its mythologies. There are many myths behind Draco, due to its resemblence to a dragon. 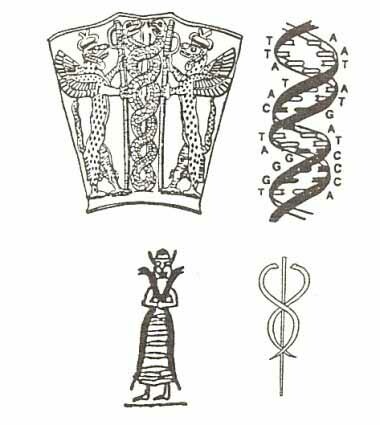 Dragon symbology represents human DNA. In the first legend, Draco represents the dragon killed by Cadmus before founding the city of Boeotia. In the second legend, it represents the dragon that guarded the Golden Fleece and was killed by Jason. The Persians have regarded Draco as a man-eating serpent called 'Azhdeha'. In early Hindu worship, Draco is given the form of an alligator known as 'Shi-shu-mara'. 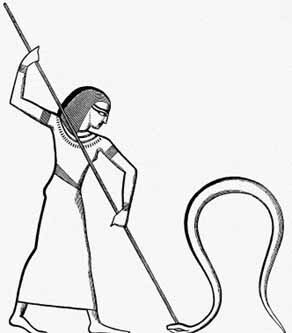 The legend of Marduk is repeated in many cultures with similar tales of dragon slayers. Perseus, Hercules, Cadmus, Siegfried, Beowulf and St. George are all examples. The origin of the constellation, Draco, and of most dragon lore as well, was probably the female Chaldean dragon Tiamat, the sea serpent who existed even before the sea and sky had been divided from each other, the dragon of chaos. Tiamat was a monster of primeval darkness, just such a monster as exists in almost every mythology and must be overcome by the powers of sunlight before the creation of the world can take place. The Sumerians and Babylonians those early inhabitants of the Tigris and Euphrates Valley from whom we have inherited so much of our mythology and astronomy alike, envisioned the beginnings of creation as a hazy state of chaos, a gloom that was nothing in itself and yet contained the potentialities of all things. With the passing of time, the first gods arose from this primordial sea and come into conflict with the force that had given them birth, the deep, wild, creative but evil force of this ocean dragon Tiamat. Tiamat gained possession of the Tablets of Fate, which were supposed to confer upon their owner the power to rule the universe, and gave them to her husband for safekeeping. Then she challenged the authority of the newly risen gods and rose against them in rebellion, summoning forth out of the slimy depths all the most frightful creatures that her evil brain could conceive to help her in the struggle, monsters whose like has never been seen again: serpents whose fangs dripped poison, scorpion-men and fish-men and monster-dogs. So horrible were these creations that even the gods took fright and hid themselves safely away in their airy heaven and no one of them would go down to meet Tiamat. No one, that is, until at last Marduk of Babylon came forth from among them and offered to fight as their champion. He was equipped with special magic powers bestowed on him by each one of the other gods at a hurriedly summoned council of war and thus armed, he went down to face the sea serpent in battle. Even Marduk trembled and almost lost heart at the sight of the dragon and her monster brood. But Marduk had both strength and cunning. He had on his side the winds of heaven and, summoning all their strength together, he sent these on before him and they blew straight into the jaws of the unsuspecting Tiamat. They rushed through her open mouth in a surging current, with all the tearing force of those great hurricanes that sometimes sweep the sea, and blew so fiercely into the very bowels of her body that she was racked and split asunder; then Marduk finished off the helpless monster with a blow of his club. The serpents and the dogs and the scorpion men were useless without the power of their evil genius, and presumably they slunk away and vanished into that yet untamed sea from which they had come. Some say that they are still to be seen in the darkness of heaven, where they have taken on the shape of the twelve signs of the Zodiac. The north wind carried away the blood of Tiamat, and Marduk split her skull and tore her dragon skin into two pieces. With these he formed the heaven and earth, separating one from the other, and in the upper regions he set the homes of the gods, created the stars in the sky, and ordained the paths they should follow. He outlined the constellations, placing them so that they should serve as signs to indicate the day, the years and the seasons to mankind. he fixed the dome of heaven in place with a great bolt, and set a watchman there to guard it. He surveyed the skies, and built the Zodiac. Then he rested from his labors, hailed by gods and men alike as the dragon slayer. The Dragon was the traditional guardian of temples and treasures as well as the springs of life and immortality. Hera, Queen of the Gods, enlisted the assistance of Draco to serve as protector of the precious golden apples, which she had presented Zeus on the day of their wedding. While performing this task, Draco was tragically slain by The Hero, Hercules, who stole away with the golden apples, which became a symbol of his immortality. Outraged by Hercules' daring accomplishment, Queen Hera rewarded Draco for his faithfulness by lifting him up into the sky to be remembered forever as a constellation and to be seen by all for eternity. Athena was the Goddess of Arts, Crafts and War. There were also terrifying figures cast up out of the volcanic fires that belched out of the bowels of Earth. These monsters, who represented the universal forces of evil, were known as the Titans, or the Giants. During the battle, which lasted for ten long years, one the Titans hurled a fierce dragon at Athena. So great was her strength and so effective her magic shield that Athena was not frightened. She caught the dragon and, with one mighty heave, swung him high into the heavens. Up he soared, twisting and coiling this way and that until his long body had become tied in knots. He came to rest in the northern sky and became fixed to that region around which the northern stars circle. Today we see him forever asleep as the much-knotted, battered, and twisted Draco. I remember seeing a very bright light in the night sky. It was so bright and I stood there and stared at it for about twenty minutes. I then got my binoculars to get a closer look. Suddenly it spread these huge colorful wings and at the same time, beams of light was being injected into it. I say "injected" because it looked as if something was shooting the beams into it. I then ran to get my camera and zoomed in to take a picture. I magnified the photo to get a closer look and it looked like whatever it was had a head and a tail. So I thought, maybe there are dragons in the sky and that particular one was being targeted with lasers of a sort. I remember doing research trying to figure out what it was I saw, but years later I'm still left guessing. The photo is dated July 17, 2004. I tried to participate, but I guess this is a dead issue. Dragons and some stars. Still don't get it. And Draco sounds so like a fish gills breathing. Any real to this thing about reptilians besides some stars and heresay on paper or what a painted canvas we look at as stars? I'm not sure about any of it. I just shared a photo that I took of what I saw in the night sky. I guess I was hoping someone would know what I was viewing.